The Preserve Spa at Napa Valley Marriott Hotel, just off of Highway 29, affords guests the chance to experience the charm and beauty of California’s world-famous wine country. On-site concierges will delight in revealing Napa’s hidden treasures and are experts when it comes to recommending memorable area experiences. Or, guests can simply take advantage of the hotel’s ability to fulfill each guest’s passion for wine, world-class food at VINeleven restaurant, and sheer relaxation at the full-service Preserve Spa & Salon. Inspired by the fertile landscape that surrounds the Napa Valley vineyards, the spa uses nature as inspiration to create a wellness journey where outer beauty and inner health are restored and balanced. At the full-service Preserve Spa & Salon, each spa-goer’s journey begins with a soft plush robe, comfortable slippers, and a soothing eucalyptus steam shower, complimentary with any 50 minute spa service. Once relaxed, they can select from reviving Napa spa treatments, including massages, manicures, pedicures, and facials, with the goal of achieving total rejuvenation. The spa and salon features specialized treatment rooms that offer comfort and tranquility, complemented by a fitness center that features state-of-the-art cardio equipment, free weights, and flat-panel TVs. 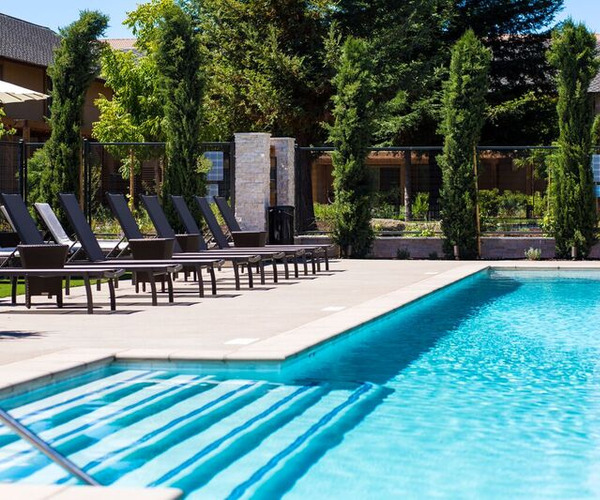 Spa guests also can purchase a pass for the outdoor pool at the Napa Valley Marriott, located directly next door. 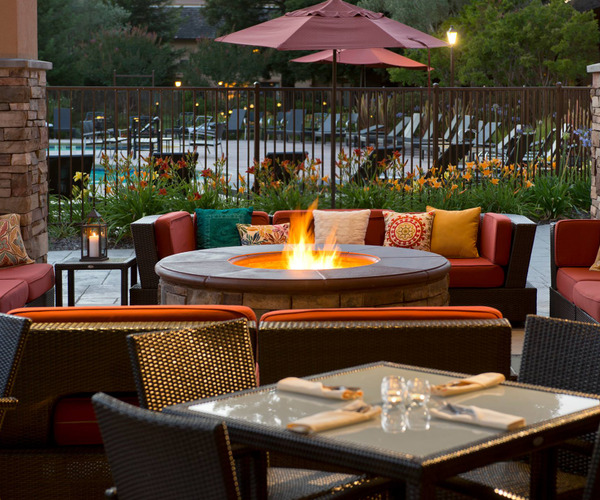 While staying at this Napa hotel, guests can indulge and treat themselves to all that wine country has to offer. Not far from Infineon Raceway, Napa Valley Marriott Hotel is within close proximity of 400 wineries (the Napa Valley Wine Train makes for a fun day of tastings and exploring! ), as well as the championship Eagle Vines Golf Course. Other sightseeing attractions to behold include The Culinary Institute of America at Greystone, downtown Napa, Yountville, and St. Helena. For shopping fans, there is Premium Outlets; meanwhile, families can spend the day at Six Flags Discovery Kingdom. On-property hotel amenities include an exercise area stocked with cardiovascular equipment and free weights; a heated outdoor swimming pool; sauna; and whirlpool. The Napa Valley guest rooms are designed to surround guests with comfort and beauty. Visitors will receive a peaceful night’s sleep atop pillow-top mattresses and luxurious linens, and stay connected as needed with wireless high-speed Internet access. Each room is equipped with an ergonomic desk and flat-screen, high-definition TV, as well as in-room coffee service, hair dryers, irons, and ironing boards. At VINeleven, Napa Valley Executive Chef Brian Whitmer incorporates local, seasonal ingredients to create simple American dishes with a gourmet touch. Indoor and outdoor seating is available, and the restaurant is open for breakfast, lunch, and dinner. Those who do not have time for a full-service meal can stop by Market at VINeleven, which features freshly brewed Starbucks coffee and quick snacks.